When it comes to wearing fluorescent orange clothing while hunting big game and turkeys in New York, the regulations are simple – there aren’t any. 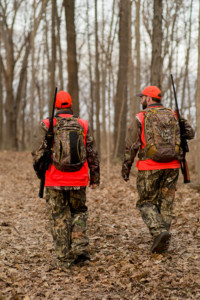 The lone exception is during the mentored youth gun hunt for deer and bear when hunters ages 14 and 15, and their mentors, are required to wear at least 250 square inches of solid or patterned fluorescent orange or pink. The DEC strongly encourages hunters to wear blaze orange for safety, but many hunters choose not to. Contrast this to Pennsylvania, where hunters are burdened with more blaze orange regulations than they can keep track of. I’ve hunted Pennsylvania for 60 years and I still do, but I’ll admit there are times I could have been cited for a blaze orange violation while archery hunting even though I do my best to fully comply. While bowhunting, I always carry a blaze orange hat, vest and tree marker in my pack, but the problem is keeping track of the opening and closing dates of the various October seasons and when blaze orange is required to be used and how much of it is required. Several times in the past, I was in a hurry to get to my stand during the overlapping bow and muzzleloader seasons and simply forgot to put on my vest and hat as required. On several other occasions, I wore the required orange only to climb the tree, settle into my stand and then remember that I didn’t tie the required blaze orange marker within 15 feet of where I was hunting. Forgetting to comply is no excuse, and if I encountered a game warden on my way out of the woods, I’d have no defense. On those rare occasions I was lucky. Archery season in the Keystone State used to be six weeks long with no overlapping with other seasons, but this is no longer true. Currently, bowhunters are required to wear an orange hat when moving in areas during an overlap with the fall turkey season and are required to wear a fluorescent hat and vest during the overlap of the October muzzleloader season. In addition, they are required to mark their location with fluorescent orange material while in the stand. If you are going to hunt Pennsylvania turkeys in the fall, you had better be wearing an orange hat while moving or you’ll be in violation. Got all that? As a bowhunter, I find the problem is keeping track of the opening and closing dates of all these seasons, especially since Pennsylvania no longer provides a free hunting and trapping digest when a license is issued. The state, however, does issue a complimentary “pocket guide” that contains general hunting regulations, hunting hours, fluorescent orange requirements, a map of the Wildlife Management Units, and season dates and bag limits. It’s up to the hunter to read it and to become familiar with these regulations and to comply. Thankfully, the Game Commission recognizes this mish-mosh of regulations and may do something about them. The Commission is currently considering abolishing the blaze orange requirement for archers, but fall turkey hunters would still be required to wear an orange hat while moving. The regulations concerning deer and bear hunting during the firearms season would remain the same. No orange is required for hunting spring turkeys because that requirement was rescinded back in the late ’90s. Final approval for these changes may come in April of this year.